If I had to choose one vegetable to grow, it'd be green beans. And since this post is all about beans, I just have to tell you about my absolute favorite one in the whole wide world. Do you hear the excitement in my voice? You see, my family has passed down this particular heirloom bean for over one hundred years — the Tarheel green pole bean. My grandparents brought it with them when they migrated to Washington state from the mountains of North Carolina in 1941. I have a certain love affair with gardening and heirloom seeds, but if you don't already love heirloom seeds, listen to this and you'll be just as smitten as I am. Heirloom seeds exist today just as they existed when God created them — science has not altered them or sterilized them by hybridization. Unlike GMO seeds, they aren't freakishly dangerous to our health and the environment. Beans are wonderful plants, providing benefits to our bodies and our garden soil. Through my many years of growing beans in my own garden, I have discovered a few tips. Here they are. 1. Directly sow your beans. Beans do not grow well as seedlings or transplants. They are best sowed directly into the ground as a seed. Beans should be sown when the soil temperature (not the air temperature) is at least 60 degrees Fahrenheit. 2. Soak your beans overnight. The night before you plant your beans, soak the seeds in room temperature water over night. This will greatly speed up the germination process. However, if the weatherman foretells rain for your region during your bean-planting week, don't soak the seeds because they could rot. 3, Plant your beans where your brassicas were planted the previous year. Beans are an excellent plant when it comes to crop rotation because they help fix nitrogen in the soil. It's a good idea plant them where members of the brassica family (cabbage, broccoli, Brussels sprouts, or cauliflower) were planted the previous year. 4. Take advantage of companion planting. Beans are a fairly non-picky plant and get along nicely with almost everything else. The only plants you shouldn't plant in their vicinity are members of the allium family, like onions, garlic, leek and scallions. The allium family can inhibit or stunt the growth of green beans. 5. 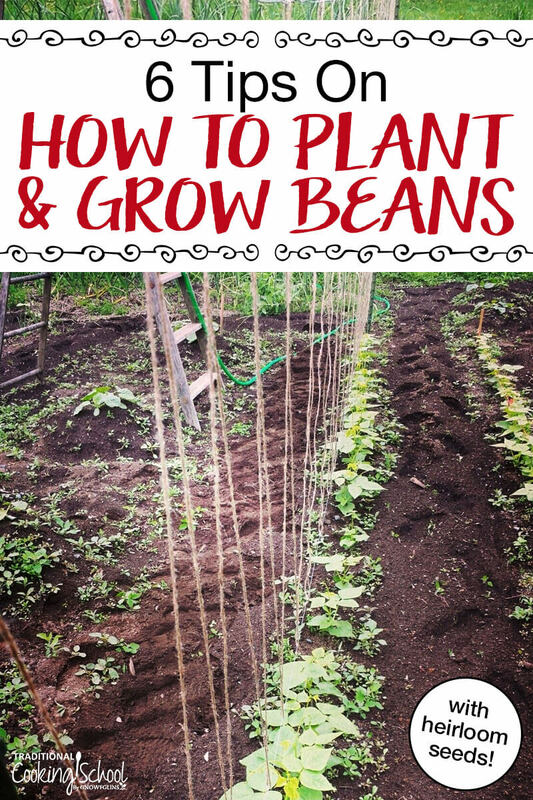 Run a string over your planted bean seeds. Birds are notorious for pulling up new bean sprouts. If you tie a string just an inch or two over the row of sprouts, it prevents the birds from pulling them up. After the beans are a few inches tall, you can remove the string. 6. Know if the beans are a bush or pole variety. The seed package should tell you if it's a pole or bush variety. Bush beans don't need a support system and are rather bushy and lower to the ground. Pole beans send up vine runners and need something to climb. You can use a pole, fencing, or even run strands of string or wire between two poles to create a trellis system. Once the runners begin to grow, you need to get the plants something to climb on. They won't grow if they don't have their support system. After putting your climbing supports in place, the beans literally grow inches overnight. Our bean is a pole variety and quite prolific. We grow 2 rows of beans and there's enough to can over 80 jars of green beans, shell out and use the inner beans of the mature pods as white beans, and save seeds for dry beans and next year's crop. What's your favorite type of bean to grow? Do you practice seed saving? You’re ahead of us. We can’t direct sow until the end of May! I’m anxiously awaiting. No wonder most of my seedlings didn’t sprout… I started 2 dozen of them about 3 weeks ago in starter pots, and only 3 sprouted! It’s not too late for me to plant them in the soil so I’ll follow your instructions for doing that. Whew! I sure am glad I saw this post! I’m glad you saw it, too! Be sure the soil is warm and moist and they should sprout well. Great info! I did not know that about using string to ward off the birds. I will definitely keep that in mind. We had really good success last year with Kentucky Pole beans. I want to do some more but I am a little late getting them in. I have also had good success with a bush bean called “speedy” that we got through Territorial Seed. The flavor wasn’t quite as good as the pole bean, but they did grow fast and we harvested them pretty quickly. The pole beans are a little bit more work, but I think worth it for their flavor. Our season is pretty short, from May 31 to about September 15th, but most beans will still produce a nice crop for us in that amount of time! I can’t wait to get planting. My husband is from Spruce Pine N.C. My little Motherinlove used to plant Mountaineer half runners. Would that be the same thing as your Tarheel pole beans. MHR are a short bean with about 7 white beans and strings that are easy to remove. I live in Louisiana and would love to plant some of your seeds. Even a dozen would be helpful. That is SO cool that you have bean seeds that have been passed down by your family! I’m hoping I can do the same with my children & one day grandchildren. We’re growing 140 varieties of veggies & herbs this year, 80% are heirlooms as it’s my new love affair. I’m excited about some new heirloom beans we’re trying this year: blue coco, good mother stallard, crimson fava bean, beurre de rocquencourt, rattlesnake, red bisbee cowpea, and italian rose. I love the string above the beans to deter birds, great idea. Now that’s an awesome line up of beans! You must have a pretty garden space? Let me know how which bean ends up being your favorite. Half-runners only climb a short distance. Most don’t have to be strung up. We plant those little 3″ long Greasy beans. It took my husband and I three hours to pick a bushel, but they are so worth it. We got seed from co-worker whose seed had been saved about 90 years now. I can them whole. I live in Bakersville, about 16 miles from Spruce Pine. My family has grown the heirloom Rattlesnake pole bean for nearly 50 years. It is awesome young, filled out or as a shelly. The seeds are easily saved. I think you can still get them from Landrum’s mail order. Rattlesnake pole beans are my favorite! I can’t wait to enjoy them this summer! I planted the Tarheel beans that I won on the 8th, and thanks for the information about the string . It is a good idea. Last year we put a fence around the garden to keep out the critters and it did help so now the string will help for the birds. I will let you know hoe the beans did later. Do you have any extra beans you would be willing to send? I’d love to try this! What a heritage for your family (food-wise)!!! I don’t sell the beans, but if you email me at melissa(at)melissaknorris(dot)com (this is spelled out to avoid spam emails from robots) I’ll give you my address for you to send me a self-addressed stamped envelope for some seeds. Our October bean seed is very similar to Dragon’s Tongue. A great bean. Hmm, not sure on the ant problem. I haven’t experienced that. You could try sprinkling food grade Diatomaceous Earth around the rows. I’m not sure if that will deter the ants or not, but it is natural. Good luck! Carol I use water to take care of the ants. If your soil it’s to dry they will colonize rapidly. I maintain a small organic garden myself. I’m composting everything so I have to wait before introducing anything to garden soil. Make sure there are no whole bits of food or sugars left to decompose. This will certainly attract the wrong critters otherwise. Also try presoaking your soil for a week after amending and topping with compost. The ground has to be warm and with the soaking you will have kickstarted the microbial process and will be ahead of the game. Good lucks to you. I have to give you positive recognition for not grabbing for the pesticide and I thank you and I’m sure everyone who knows their dangers thanks you as well. keep up the good practice and desire for safer soil and food! Baking soda and powdered sugar. Mix equal parts and sprinkle around ant hills. You must use the powdered sugar, not granulated table sugar because of the size of the particles. The ants pick up the particles and carry them back to the hill. Baking soda kills the ants, but the sugar entices them. They don’t seem to know the difference until it’s too late. How long are your two rows of beans? They’re about twelve feet long. Hi, love the stringy trellis trellis thing you’re using! Could you maybe post a better picture of it? I would love to try to recreate it! Hi, unfortunately, my beans aren’t ready for the trellis and I don’t have another picture handy. But you string a top and bottom row above the beans. Then take your string and form a continuing V by looping it over the top, down at a diagonal to the bottom string, and then back up to the top all the way down the row. We pound two metal t-posts at each end of the row to tie our string trellis on. This is really great advice, thanks! I’m curious how/why putting a string over the beans keeps the birds away? The string helps hide the sprouts from the air, plus, it makes them harder for the to get to if they do happen to land in the garden. pole beans american natives used tall corn was keep weeds out the corn and so beans run up and around the corn. they first used corn and beans. Thank you so much for this post! My mum use to grow wonderful scarlet runner beans all along our back fence and she would end up with tons of them which she froze for the winter. I tried growing them last year, hoping for the same results my mum had but no such luck. The little sprouts were taken by some very hungry bunnies and birds and I ended up with nothing :(. I am trying again this year with some fencing around them (thanks for the string tip). I would love to hear more about what you do with your beans. When do you pick and shell your mature beans for drying? How do you dry them and store them? Thanks! I always start my beans, and peas, in a saucer covered with blotting paper folded in half (kitchen towel would probably work just as well). I place the seeds apart from each other between the sheets of paper then dampen it. Making sure it is kept damp I wait until the seeds start to germinate before placing them in individual egg box holes, the sort made from recycled paper which will disintergrate when placed in the ground. I then wait for them to grow until the roots start showing through the sides of the paper egg boxes before cutting each box into its component parts, either 18 or 24 in the trays from our local free range farm, and then placing each small plantling into the ground to grow even larger. I learned to do this from my parents, who probably also learned from their parents and it’s never failed me yet (except for the year it rained non-stop and every vegetable plant rotted in the ground). I grow a mix of climbing and dwarf green beans plus scarlet runners (I’m old fashioned) as well as early and main crop peas. Hi there, just wondering how many bean plants are suitable for a pole/string? We use one pole per bean plant. When I’m stringing like the photo at the top, I try to do a string for each plant, but sometimes they intertwine and will go up one string with two plants. Either way they seem to do great. Congrats on your first time with beans! Any ideas how to stop the local ANTS from hijacking string bean sprouts? Hi.thanks a lot for the tips on growing beans.i loved your string idea as most of my seeds r being pecked by the peacocks n other birds.3 of my seedlings have sprouted n started yeilding but growth not upto expectation.i think it needs a support.will try out ur tips n keep u informed. How long are your rows? How many plants per row? What size jars are you using to can? Pint or quart? I’m needing to grow & can approximately 100-120 jars. I’m the one with the land but I’m growing & canning for my home, my daughter’s home & for my parents. My mom helped me plant a late summer harvest of bush beans last year, as I was hugely pregnant when we moved into our new home that had a perfect little south-facing spot of dirt, and didn’t get to ‘prep’ the garden for a spring planting. Living in “Suburbia” of the Pacific Northwest, I don’t have a lot of garden space, but I’m hoping this year to create a few more spots for growing vegetables. My young kids had a blast helping plant everything and then watching the growing process. My bush beans kind of took over the whole plot, so I’m thinking of planting them in a different spot this year. Are beans one of those plants that really needs full sun, or would they do okay in an eastern-facing spot that gets sun 3/4 of the day? One of the things I miss most about living in NC is the ‘leather back’ beans. They are pole beans that were sun dried (we used to lay rows and rows of them on an old sun bleached wooden picnic table on hot, dry days) and then cooked as usual. These were the BEST beans and I’m not kidding. I live in FL now and have tried to replicate them. They are pretty good but not AS good. My question is A: has anybody else experienced this wonderful technique and B: is there a certain kind of pole bean that I should be using? Our poles beans can be made into “leather britches” same thing, just a slightly different name. I’m thinking it the bean type… my father loves beans done that way. Two rows, 80 jars. How long are your rows? The rows are about 20 foot long. Pole beans are quite prolific, another reason I love them! Do you have more pictures of your supports for the pole beans? Love your article! Can’t wait to get started! I just found this article on bean growing and was wondering if you would be willing to share some of your heirloom seeds? I would be thrilled to have such an old plant even at a price!